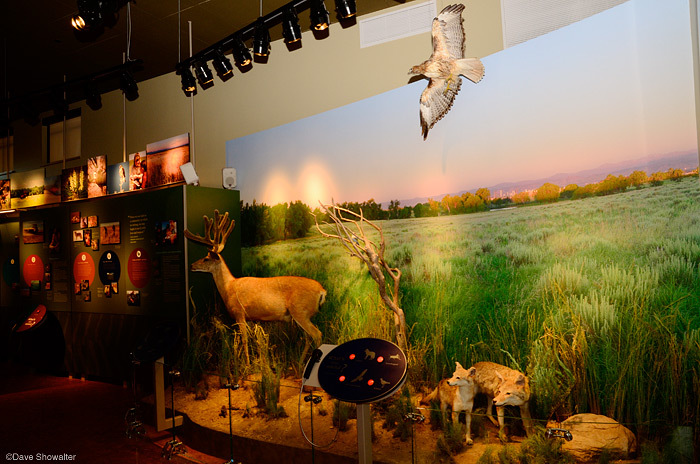 I was commissioned to make this large summer diorama for the new LEED Gold visitor center at Rocky Mountain Arsenal NWR, in Commerce City, Colorado. This 11 x 16 1/2 foot diorama includes the Denver skyline for reference, an important element for our premier urban refuge. I traveled all over the refuge looking for the right location before deciding that this area, with verdant sand sage and warm season native grasses would be perfect for the summer mural. The size is the same ratio as 35mm, so I was able to make in camera test shots to see what the final composition would look like. I used my DSLR to create two rows of 12 images and later used Photoshop to stitch all of the high resolution images into one giant raw file. The file was cropped to size and adjusted to match the rich colors that I saw in the field as first light painted the grassland and distant skyline. I then used OnOne Software's Genuine Fractals program to up-res the image to it's massive size. As I recall, it took about 12 hours to send the file to the developer via FTP. It's quite gratifying to see the two murals in the newly completed visitor center. Photo © copyright by Dave Showalter.